Click on the buttons below to see and purchase our line of products in HO or N scale. At this time only US domestic orders can be made from our online store. For international order please call or email us. Custom Model Railroads, 3937 Keswick Rd., Baltimore, MD 21211. Download a PDF copy of our order form here. Custom Model Railroads specializes in the design and manufacture of custom built and craft-kit structures as well as one of a kind custom built structures. Our kits are modeled on actual buildings and structures which we believe you will find to be unique and deserving of a place on your model railroad. CMR offers kit building services as well. This includes construction, painting, weathering, window shades, adding extra details and lighting. Construction is museum quality which involves hours of time, orders are built as needed to your specifications by our staff. If you would like to have a kit built please contact us to discuss details, pricing and delivery. If you have a specific structure which you would like to have us custom build, feel free to contact us to discuss your project. 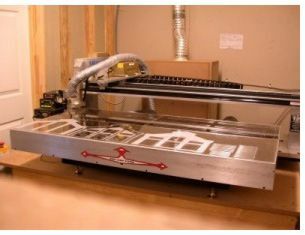 All CMR kits are manufactured in the USA by CMR using state of the art laser cutting equipment and high quality acrylic. Our laser cutting equipment is accurate to 1/1000th of an inch which allows us to make parts exactly to specification. Acrylic, unlike styrene, wood or cardstock, is a rigid and very stable material. Acrylic wall sections will not have any warping or dimensional change; therefore, when glued together, parts will fit perfectly. Large pieces will remain flat and need less interior bracing. Painting is easy using most commercial paint, with spray paint and acrylic paints working exceptionally well. Brick and roofing materials are created using a patterned sheet which is applied to the acrylic with an adhesive backed paper included in the kit. Laser engraving is used to create stone mortar, window pane detail and other detailed parts. Some models contain cast plaster parts and detail parts as well. All parts are cut and remain on a spur for ease of part identification. Thorough text and graphical instructions are included with each kit. Everything you need is included except tools, paint and glue. 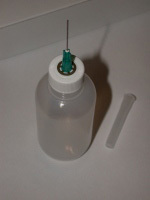 A Polyethelene glue bottle with a blunt needle applicator is available for $4.00 (glue not included). It allows you to place glue exactly where you want it and dispense it quickly. You can fill it with your favorite solvent based glue, such as Tenax or Plastruct Weld Bond. We offer excellent customer service after buying our kits. If you have a question, need modeling advice or a replacement part, we are here to help you. We are sure that you will enjoy building these structures as much as we do.